Assuming you don't feel like taking my word for it, the best thing you can do is arm yourself with a better understanding of what we consider true/real power and dynamics are. We need to start by understanding the volume control and how it is used. In any given system you will slowly raise the volume control to a certain point and stop. That becomes your desired listening level. What made you stop turning the volume control at that exact point? Why not a little above or below that point? The answer is mainly about frequency balance, detail, depth of field and soundstage. If you don't turn the volume up high enough, the music lacks body and weight - it sounds a bit thin, perhaps even a little dry and light (some say tinny). Coherent detail is also harder to determine as the volume is not high enough to properly project it. On the other hand if you turn the volume up too high, the sound starts getting worse, sometimes too loud or less pleasant to listen to. This is due to a number of reasons, such as distortions in the speakers, and or room acoustics, usually a little of each. Assuming your speakers are reasonably efficient and can handle the power of your amplifier and your room is of good proportions and the acoustics inside that room are listenable, the special "sweet" spot on your volume control is determined more by the amplifier than by you. High power solid state amplifiers, say anything over 100 watts will force the sweet spot on the volume control higher before there is a nice bloom. On the other hand lower power tube amplifiers behave in a different way altogether. If you look at the high power listening experience with respect to the power output the solid state amp will not start to develop a good sound stage until it is delivering a large amount of power, on the other hand the tube amplifier will develop a good sound from very low in its power output. . The tube amplifier without a lower limit determining when the amp will sound good, you can have fully developed detail, weight and bloom even at 1 watt! This can be (and is) rather empowering because now you determine what level you want to listen at, not the amplifier. So from this we see that our lower power tube amplifiers have more detail and weight at lower volumes than higher powered solid state amps. USABLE POWER is the point on the volume control where a listener will stop turning up the volume knob when he is interested in playing the amp as loud as it will go and still sound good. It is that exact point on the dial when the sound stops getting better and starts to go into distortion. (Normally in solid state amps this is when the amp shifts from class A to class AB1 or even AB2). Class A operation is the least efficient form of amplification but also by far the best sounding. It is also one of the best methods for getting usable power. Some amps have way more usable power than others. For example, you can have an amplifier that is rated at 25 - 50 watts that has less usable power than an amp rated at 8 watts. 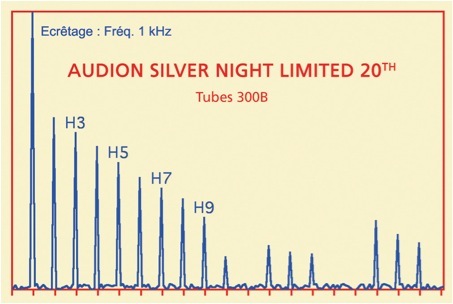 We have compared many amps at the 50 - 80 watt power level and have found that the bigger amps do get louder, it is our humble 8 watt Silver Night Stereo that we were able to play the speakers loudest with. This little amp had the most usable power. When the sound quality isn't there at higher volumes with a big amp the extra power is worthless. Add to that the issue that they have to be turned up a fair amount to get the bloom and you could say the power on the low end of the scale is also worthless. Aside from that at the higher volume levels the noise of the higher powered amps becomes fatiguing far sooner. DYNAMICS, So how do we get good dynamics out of our small 8 watt amplifier? Stop assuming that it is somehow deficient to start with. Make the choice of efficient loudspeakers and you can play as loud as you want. Dynamics are greater in our low power tube amps matched with high efficiency speakers than you'll be able to get from a high power amp on low efficiency speakers.. In a quiet room with a low power amp and speakers of 92dB or higher efficiency you can expect around 30 dB of dynamic range in the first watt. (NOTE: It takes a doubling of power to increase the volume by 3dB). When you add a second watt of power you increase the dynamic range by only 3 more dB. If you double the power again to 4 watts you'll gain another 3dB and 8 watts gets you 3 more. By the time you keep doubling your power to get that additional 30db you require 1024 watts. So obviously power has a steep ramp of diminishing returns. a 100 watt amp is only 3dB more powerful than a 50 watt amp, or 6db than a 25 watt amplifier , almost un-noticeable. IF THE FIRST WATT ISN'T GOOD WHY CONTINUE. This is a key point. Many poorly designed loudspeakers with multiple drivers and complex crossovers loses most of the first watt in the crossover network before it even reaches the drivers and because the drivers have too much moving mass, the remainder of the first watt of power is difficult to be heard. Most hi-fi loudspeakers start with the second watt - meaning that first 30 dB of dynamic range (music) is largely missing. It's not surprising many audiophiles build large high power systems up to 1000 watts trying to reach a dynamic range of 30 dB while at the same time another person sits in his listening room getting more than 30dB out of our 3 watt 2A3 amplifier with appropriate speakers. USABLE POWER IS NOT AN AMPLIFIER TYPE, Since we tend to categorize things lets mention that not all low power amps have a high percentage of usable power. Ours have nearly 100% usable power, while others may have less than 50%. The determining factor is the design of the amplifier itself. USABLE POWER INTO LOAD, Usable power can not be measured on a scope using a resistive load which is how RMS power is measured, although this is exactly how we measure true RMS readings for our spec. sheet. Loudspeakers are very complex loads having variable resistance, capacitance, inductance and impedance - not to mention the voltage they reflect back to the amplifier. 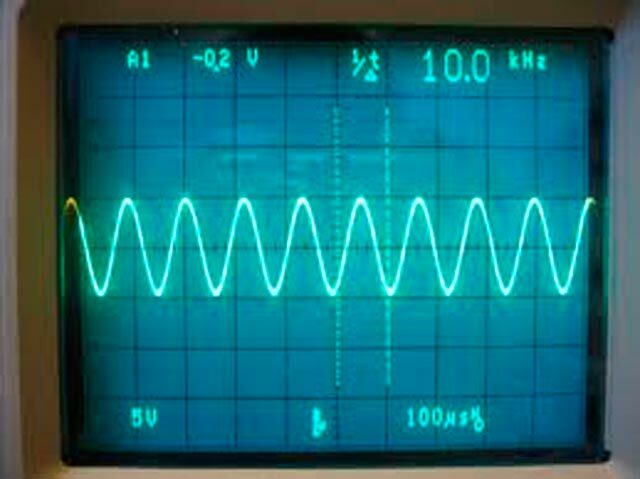 An amplifier's ability to deal with this and the ability of the amplifier is able to put on the voice coil is always different than the amplifiers rated power. A good analogy is to liken it to engine horsepower compared to rear wheel horsepower. However it's not just the amount of power that reaches the voice coil - it's how much of that power makes the speakers sound good. (think of it as traction, or lack of tyre spin) It's how loud you can get that speaker to play before it starts sounding bad. AMP & OUTPUT TRANSFORMER DESIGN, Since usable power is largely enhanced with class A operation. Amps boasting high power figures because they go into class AB operation quickly to get the efficiency up. All Audion amplifiers use our own in-house designed and built output transformers. These transformers are the key to usable power and control of voice coils and reflected load. Couple this to extremely good design in our amplifier circuits, huge power supplies capable of handling extreme music fluctuations and conservative power ratings with no "flim flam" you have a product with true usable power from the first watt. There is just no reason to build bad amps in my opinion. It is far easier also to give accurate measurements than try to deceive your customers. 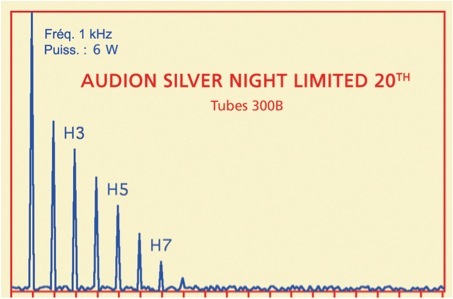 For example I could easily say that our Silver Night PSE 300B giving 18 Watts per channel at 1khz into an 8 ohm load is a 36 watt amplifier with the same specifications or if I really wanted to deceive, I could go a stage further and say it is a 72 watt amplifier (into a 4 ohm load) or really cheat and say 144 watts (into 2 ohm) or could just downright lie, and put any figure there, going into clipping at a different input frequency etc. etc. And to the Sterling Stereo Anniversary EL34 hard wired you will see before you giving 12 Watts per channel at 1khz into an 8 ohm load. Many would call this a 24 watt amplifier with the same specifications or as above if I really wanted to deceive, I could go a stage further and say it is a 48 watt amplifier (even round up to 50W) (into a 4 ohm load) or really cheat and say 100 watts (into 2 ohms). Playing with numbers is very easy when there are no standards, the likes of Cary and many Chinese manufacturers do it all the time. The case that comes to mind is from the computer industry, you buy a pair of computer monitors that claim 300W PMPO (peak music power output) in reality these are less than 0.5 watts true RMS value and in reality probably only one quarter of one watt of usable power. Not a nice thing to find out and certainly deflates the bubble in bragging rites. Clean usable watts are far more important than published specifications. An amplifiers ability to see difficult speaker loads and handle them with ease is critical in your choice of amplifier. The First watt is the most important watt. If the first is good so will be the rest.